Tiny Ischia—just 17 square miles—has always lived in the shadow of Capri, its glitzy sister in the Bay of Naples. Though smaller, and without a single beach, Capri was favored by Roman emperors and has been the 20th-century darling of the international jet set. Ischia, with its beaches, hot springs and spas, hillside vineyards, and relative quiet, has escaped the attention of most of the world's vacationers. I suspect that the Italians, Germans, and Brits who flock here each summer may not be able to keep Ischia a secret for much longer, however. Slowly, North Americans are discovering the charms of her craggy shoreline, sandy beaches, 2,000-foot mountain, and green, fragrant hillsides. Last summer we were there, as were the Freys, Hideaways members from Greenwich, Connecticut. And so were Magic Johnson and Tom Cruise. The celebrities sailed in on their yachts; we arrived as we always did when I was a child, by car ferry, an hour-and-20-minute ride across the Bay of Naples to Ischia Porto. My husband, Bart, our two-year-old, Monique, and I landed in Naples, picked up our rental car, and headed straight for the harbor. 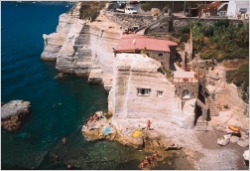 It had been a long trip—Boston to London, London to Naples—but we weren't going to stop until we got to my parents' seaside villa in Forio, on the western shore.